Tree removal companies hired by People�s Energy Cooperative trimmed or removed a number of trees along Fifth Avenue Southeast last week. 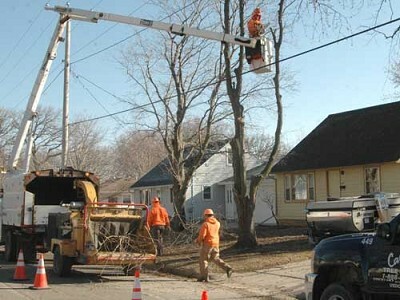 Sean Hale, public works director for the city of Stewartville, said People�s Energy wants the trees trimmed so the branches don�t interfere with power lines. If the trimming results in an odd-looking tree, some residents decide to remove certain trees entirely, Hale said. 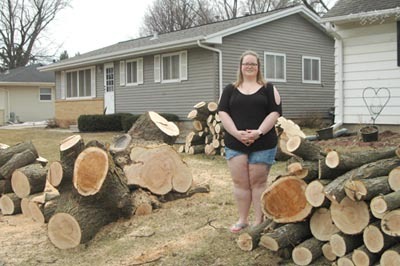 Teresa Jorgenson stands near three large piles of logs at her home at the 200 block of Fifth Avenue Southeast last week. The logs are the remains of a huge tree that stood at the property for many years. Tree removal companies hired by People's Energy Cooperative trimmed or removed a number a trees along the street last week. Sean Hale, public works director for the city of Stewartville, said People's Energy wants the trees trimmed so the branches don't interfere with nearby power lines. If the tree trimming makes a tree look odd, some residents may decide to remove the tree entirely, Hale said. City crews have also removed 20 to 30 ash trees, victims of the emerald ash borer, on public property since last fall, he said.